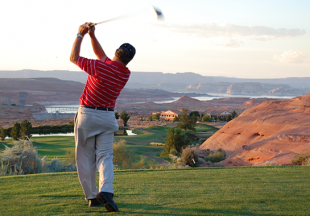 Learn about the many popular attractions in the Lake Powell area. Be sure to pick up a copy of our LAKE POWELL VISITORS GUIDE located in our outdoor information kiosks and business locations throughout Page, Arizona. View a PDF of the Visitors Guide. 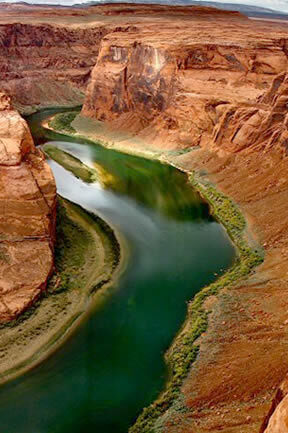 Some 3 million people from around the world visit the Lake Powell and Page, Arizona area annually. The average 4-5 day length of stay is the longest of any federal park. The crystal-clear lake, slot canyons, and red Vermilion cliffs are favorite attractions for adventure seekers, photographers and filmmakers. 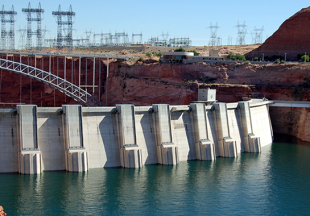 In addition to adventure and sight-seeing, the Lake Powell area offers hiking, swimming, fishing, kayaking, water-skiing, and water-boarding. Area outfitters offer guided lake tours, scenic air flights and float trips down the Colorado River. Many attractions, such as the Horseshoe Bend overlook, Glen Canyon Dam, and Carl Hayden Visitor Center can be viewed while driving along Highway 89. 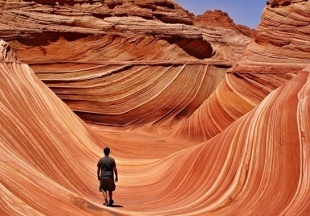 Others, such as The Wave at Coyote Buttes, require permits in advance. 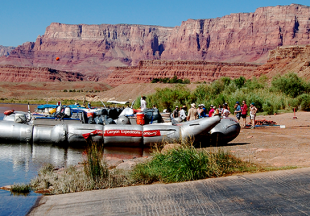 A trip to Lee’s Ferry can be combined with a half-day rafting trip from the Glen Canyon Dam as well as exploring the Vermillion Cliffs. 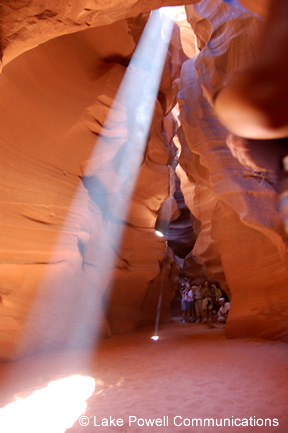 Many destinations — such as Antelope Point, Antelope Canyon, and the trail to Rainbow Bridge are run by Navajo Parks and Recreation and require permits. Run by Navajo Nation Parks and Recreation, the slot canyons at Antelope Point as well as waterholes and Rainbow Bridge trail attract millions of visitors every year. Tours to the Antelope slot canyons are provided by several Navajo-run enterprises in the City of Page as well as the Parking Lot entrances to the canyons. Built within the boundaries of both the Navajo Nation and the Glen Canyon National Recreation Area, Antelope Point Marina is part of the Navajo Nation’s Parks and Recreation Department. Full Service Marina with Restaurants, Boat Rentals, and Tours available. Coyote Buttes is part of the Vermillion Cliffs National Monument, in the Paria Canyon Wilderness Area. The Coyote Buttes Area is managed by the Bureau of Land Management and permits are required. Stop by the Paria Contact Station before beginning your hike. Personnel at the Contact Station will have the latest information on road and hiking conditions in Coyote Buttes. Please view the rules and regulations for the Coyote Buttes area. Walk-in permits to Coyote Buttes are available at the Grand Staircase-Escalante National Monument Visitor Center in Kanab, Utah, the day before you wish to hike. Buckskin Gulch is the longest continuous slot canyon in the country. It offers a variety of day and overnight hiking options. Many hikers will start their trip at the Wire Pass Trailhead, enter Buckskin Gulch after 1.7 miles and travel either up or down canyon. There are multiple 4-9 foot tall moderate obstacles requiring scrambling up and down boulder piles. 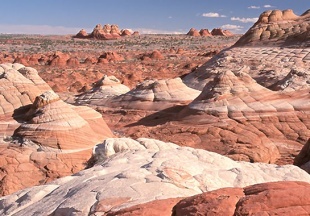 In 1984 Congress created the Paria Canyon – Vermilion Cliffs Wilderness. Coyote Buttes’ outstanding scenery, desert wildlife, colorful history, and opportunities for primitive recreation will remain free from the influence of man and are protected in this condition for future generations. Its 112,500 acres beckon adventurers who yearn for solitude, scenic splendor, and the chance to explore one of the most beautiful geologic formations in the world. 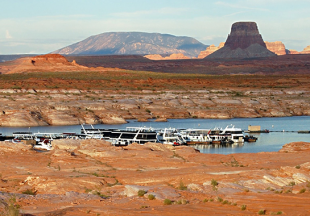 The Glen Canyon Recreational Area offers five marinas, permanent mooring for over two thousand private vessels, lodging, restaurants, campgrounds and RV facilities. Services include houseboat and powerboat rentals dockside and dry boat storage, fishing and water sports gear, groceries and general merchandise. 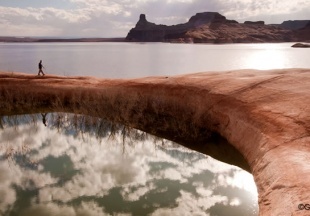 One of the best views of Lake Powell can be seen by off-roading to Alstrom Point. This overlook is hundreds of feet above Lake Powell and is one of the most photographed sites. Designated a monument in 1996, the Grand Staircase Escalante National Monument embraces a sequence of cliffs and plateaus that rise 5,500 vertical feet from the Colorado River in Arizona to Bryce Canyon national Park in Southern Utah. Four Visitor Centers can be found in the Monument at Kanab, Big Water, Escalante, and Cannonville. Each Monument features a different monument theme. This monument is the world center for dinosaur finds. In 2007 alone, two new horned dinosaur species, a giant crocodile, and a crested hadrosaur were discovered. Remarkably, skin, soft tissue, muscle, and tendon impressions were discovered along with fossilized bones. The sprawling 1.9 million acre monument hosts many scenic roads and recreational activities; including horseback riding, mountain biking, backpacking, camping, hunting, and fishing. Nearly 10000 miles of roads and trails are open to all terrain vehicles. The scenic Cotton Wood Canyon road goes through the Grand Staircase-Escalante National Monument for 46 miles from Cannonville to highway 89. This back road is amazing by itself and also gets you to the great hikes like Grosvenor Arch, the Cotton Woods Narrows, and Hackberry Canyon. This sprawling preserve was the last place to be mapped in the continental United States, a suggestion of its remoteness that along with the accompanying solitude and tranquility remain its main characteristics today. Hikers and mountain bikers will find a treasure of trails in the Page and Lake Powell area. For a sweeping view of the Glen Canyon Dam, Lake Powell, Antelope Canyon, Navajo Mountain, and Tower Butte, locals love the Loop and Rim Trail that winds eight miles around the City of Page. Access the Rim Trail near Lake View Elementary School off of North Navajo Drive. Always watch for weather changes, flash floods, and heat exposure when exploring the Lake Powell area. In the Lees Ferry area, Cathedral Wash is a moderately difficult hike of three miles round trip. Some scrambling around rocks is required. Spencer Trail is more challenging as it climbs a cliff as part of a 4.4 mile hike round trip. Agua Tierra is an easy trek on a 1.2 mile loop beginning at Lake Powell Resort at Wahweap Marina. Another easy hike is to the Hanging Gardens located near the Page side of Glen Canyon Bridge. 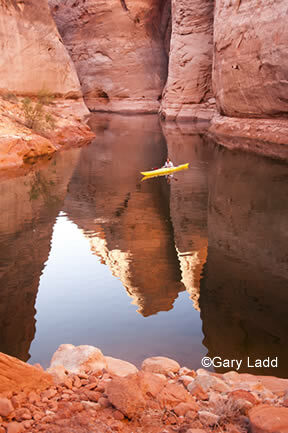 Kayaking is an excellent way to experience Lake Powell and its magnificent geologic wonders. There is no fee to launch a kayak in Glen Canyon National Recreation Area, and all launch ramps are welcome to any kind of boat. Kayakers may find it easier to launch at Antelope Point or at Glen Canyon NRA’s primitive beach camping areas. Many locals enjoy smooth day trips around the Wahweap and Lone Rock areas. Stanton Creek is the place to go in the Bullfrog area. 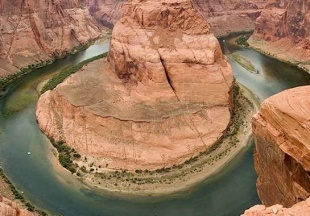 The most spectacular rafting in the world can be found traversing down the mighty Colorado river. 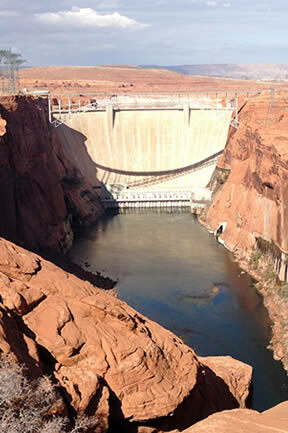 Safety recommendations and more kayaking information is available at the Glen Canyon National Recreational Area website. Nestled against a high mesa that can be seen from miles away when approaching Page, this 18-hole course has been given a four star rating by Golf Digest. From the front nine to back nine, the elevation rises 300 feet. The club store features a covered veranda and grille with a casual atmosphere and fine food at affordable prices. Navajo Parks and Recreation oversee the Upper and Lower Antelope Canyon, Upper and Lower part of the East Waterholes, as well as the Rainbow Bridge trail. 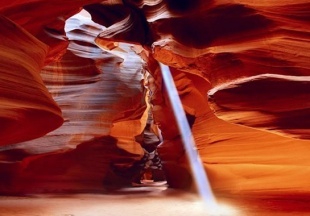 Permits must be obtained to enter these areas and guided tours are required to visit the Antelope Slot Canyons. Nestled inside of the Kaibab National Forest, the North Rim is over 1,000 feet higher than the South Rim, at an elevation of 8,000 feet. A winding road takes visitors through Ponderosa pine, quaking aspen, and gamble oak trees. 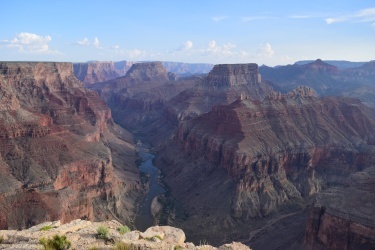 The North Rim features a lodge and dining facilities in addition to camping sites along the edge of the canyon. Nearby trails provide easy access to trails, and permits are required for camping below the rim. The Forest Service Visitor Center is located at the nearby community of Jacob Lake. Because of heavy snowfall, the North Rim closes from October to mid-May. The most spectacular rafting in the world can be found traversing down the mighty Colorado river. Located on Lake Powell Boulevard in Page, Arizona, the Powell Museum and Visitors Center is dedicated to highlighting the history of the area through exhibits as well as paleontology and geology of the area. The Museum is rich with photographic displays, videos, maps and information about local attractions. The museum bookstore features a variety of books about the Glen Canyon area as well as postcards, maps, DVDs, and videos. Use a private, rental, or tour boat. Backpack across Navajo Tribal land. 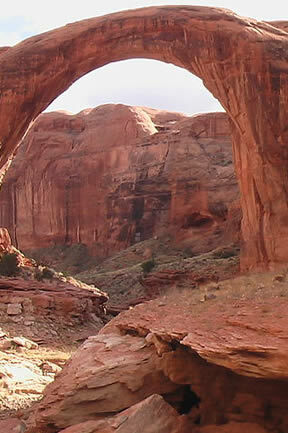 Rainbow Bridge can be reached by a two-hour boat ride on Lake Powell from either of two marinas near Page, Arizona, followed by a short mile-long walk from the National Park wharf in Bridge Canyon or by hiking several hours overland from a trailhead on the south side of Lake Powell. 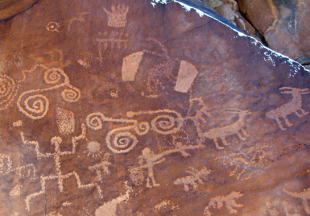 Hiking on Navajo Land requires a permit purchased in advance. Read the Navajo Nation Regulations about traveling on Navajo Land here. In the Lake Powell area, you can purchase a permit next to the LeChee Chapter House, which is 3 miles south of Page, Arizona on Coppermine Road (Navajo Route 20). Rainbow Bridge is often described as the world’s highest natural bridge. The span of Rainbow Bridge 234 feet (71 m). At the top it is 42 feet (13 m) thick and 33 feet (10 m) wide. The Vermillion Cliffs rise from 3,100 feet in elevation to over 6,500 feet, and provide a prominent towering backdrop to the Lake Powell area and can be seen in the distance as far as Winslow, Arizona. At Lee’s Ferry, the cliffs are spectacular, displaying a bright blush-red hue. The 294,000 acres of the Vermilion Cliffs National Monument span Northern Arizona and Southern Utah. The 38 mile long Paria river runs through a 2500 foot deep through Navajo sandstone slot canyon formed from ancient sand dunes that calcified into rock. 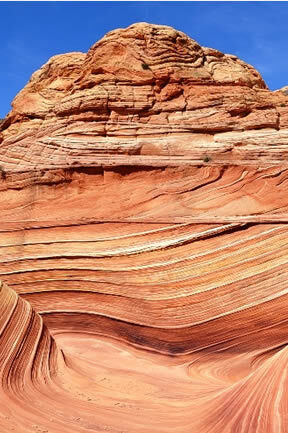 Some amazing sites to visit are the Wave, White Pockets, Buckskin Gulch, and Coyotes Buttes. In 1984 Congress created the Paria Canyon – Vermilion Cliffs Wilderness area. The Wave at Coyote Butte is a popular landmark requiring a lottery system to get permits for entry by the Bureau of Land Management. 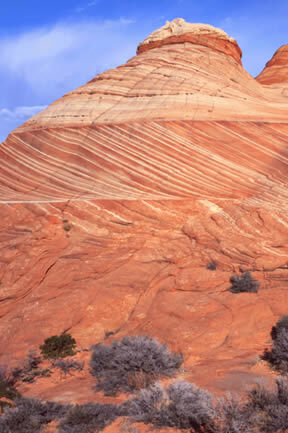 The colorful swirls of cross-bedded sandstone in Coyote Buttes are an international hiking destination. Permits to hike to The Wave at Paria Canyon are required by the Bureau of Land Management in advance by a lottery system. Wiregrass Canyon near Big Water, Utah, is a six mile hike through a sandy wash. Some scrambling around rocks is necessary. For hardy, experienced hikers, Paria Canyon is a 90-mile round trip hike with multiple river crossings.